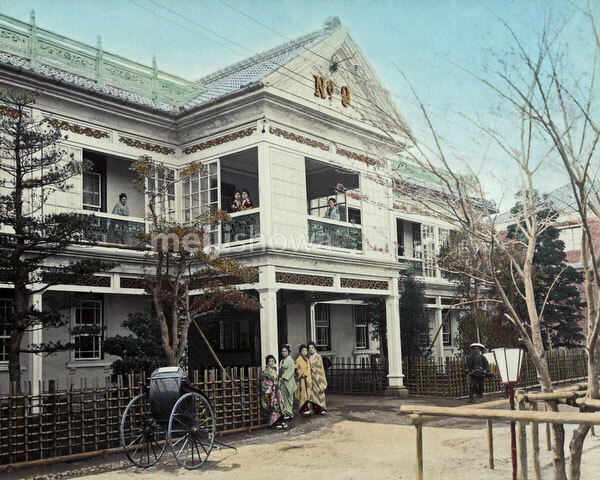 The famous house of prostitution known as Jinpuro (Nectarine) or No. 9, in Yokohama, Kanagawa Prefecture. Prostitutes are standing in the windows and a jinrikisha is lined up in front. Rudyard Kipling, who visited Japan in 1889 (Meiji 22), mentioned Jinpuro in his 1894 (Meiji 27) poem “McAndrew’s Hymn”: “Blot out the wastrel hours of mine in sin when I abode. Jane Harrigan’s an’ Number Nine, the Reddick an’ Grant Road”.